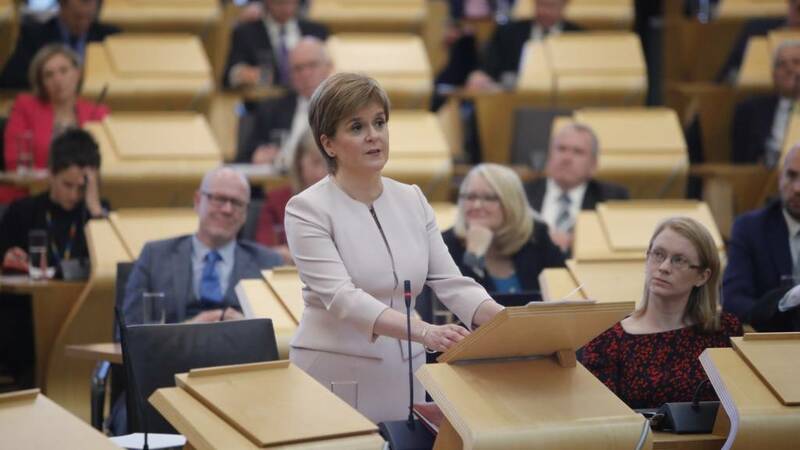 Nicola Sturgeon said Theresa May had failed to take responsibility for her role in the Brexit "mess"Image caption: Nicola Sturgeon said Theresa May had failed to take responsibility for her role in the Brexit "mess"
That's all from Holyrood Live on Thursday 21 March 2019. Prime Minister Theresa May "must change course" on Brexit "before it is too late", Nicola Sturgeon has said. Mrs May is in Brussels for talks over an extension to the Brexit deadline, having laid the blame for the delay squarely on MPs in a public statement. The Scottish first minister said Mrs May's comments were "deeply irresponsible" and "failed to accept" her own responsibility for the "mess". Ms Sturgeon said that "if all else fails", MPs should revoke Article 50. The government land reform motion, as amended by Labour, is agreed to with 83 MSPs backing it and 32 against. MSPs back the Labour amendment with 83 MSPs agreeing to it and 32 against. They reject the Green amendment, with 32 MSPs backing it and 83 against. MSPs reject the Tory amendment on land reform, 27 MSPs back it and 87 reject it. Land Reform Secretary Roseanna Cunningham says the Scottish Land Commission report is evidence based. Ms Cunningham points out there was little evidence of support for land reform in Edward Mountain's speech. She goes on to say she will resist the Green amendment today. The minister concludes: "When we talk about our aspirations for our land, we talk about our aspirations for ourselves. "Land is not a commodity it's a human right." Maurice Golden closes for the Conservatives, saying the Scottish government is one of the biggest landowners in Scotland. Land is very important to the people of Scotland, for living, food, and leisure, he says. "There is too much focus on ownership, rather than how it is being used." Most landowners are being tarred with the same brush, the West Scotland MSP states. There is cross party support for land reform, but it must be evidence-based, he adds. Privacy and safety of landowners must be respected. Labour MSP Rhoda Grant says some landowners have responded despicably to their tenants due to land reform. 150 people own 50% of Scotland's privately owned rural land, points out the Labour MSP. "We need to build thriving communities and ensure that power is shared." Ms Grant says land must not belong to the few, but the many. We must end the monopoly of land ownership, she adds. In closing, Green MSP Andy Wightman starts by speaking about tax breaks given to landowners. When he was a student, he says, it confused him why the breaks weren't going to tenant farmers instead. A 61,000 acre estate in the Highlands is run by a charitable trust, he says. Something similar happens on Bute. Feudal tenure was meant to be abolished, but lives on with these trusts, he claims. "There is so much more to be done." The Greens will support the motion and the Labour party amendment, he says. Large concentrations of land ownership are leading to power being abused in some parts of Scotland, according to a report by the Scottish Land Commission. Its investigation said a "land monopoly" in effect existed in many areas. The report also said the law provided very little protection. Scottish Land and Estates, which represents land owners, said the report did not adequately reflect the contribution made by rural businesses. The commission's report calls for a public interest test for future land sales.